Piracy has been a problem for waterway transport, since the beginning of the 17th century. Pirate attacks have increased significantly over the last 15 years and recent insurgence can be observed in Western Africa. As pirates become technologically more advanced, they are able to constrict vessels in the main shipping bottlenecks at Suez and Singapore/Malacca Straits. Pirate in these regions are not violent, however pirates in West Africa tend to use more force. The effects of piracy have an economical consequence, affecting not just transportation, but the overall supply chain. This has placed pressure on ship-owners, insurance agencies and piracy reporting centres to provide security at sea, or develop methods to mitigate risk. 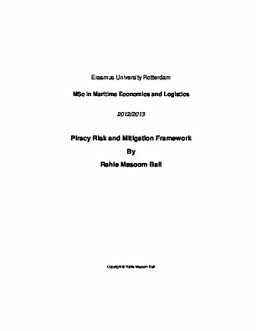 This thesis identifies the critical factors vessels should consider that makes them vulnerable to piracy attacks. These factors are then utilised to create a piracy risk and mitigation framework. The critical security factors are identified by a meta-analysis of previous studies in the field of vessel operation risk analysis and working operational manuals of shipping companies, IMO guidelines and IMB reports. These factors are quantified and are analysed using binary-logistic regression. The results of the regression show ten factors that are significant to assess risk, Geographical Region, Freeboard, Sea State, Citadel, Boarding Access, Status of the Vessel, Anti-piracy Equipment, Speed, Reporting Points and Lookouts. These factors are then prioritised using Analytic Hierarchy Process Questionnaire. The priority rankings show that Speed has the highest weightage and Boarding Access the lowest. Prioritising the factors enables us to develop a framework that incorporates operational hazards whilst assessing the risk through a score-based evaluation. The framework then identifies the severity of the hazard and propagates a mitigation response. This technique can be reused as a reviewing technique after revising the mitigation advice.